Choosing a coin holder is like picking an outfit, a highly personal decision. Each numismatist takes special care while selecting holders for his precious gold coins. Some collectors strictly go with plastic coin holders, while others prefer cardboard coin holders as the least expensive and “greener alternative”. If you own a large collection of coins of various shapes and sizes, choosing Air Tite coin holders is a great decision as these allow its users to custom fit coins even of the most unusual shapes without sacrificing coins’ storage safety. However, if you are one of many collectors who prefer cardboard coin holders, below we present a list of top 5 selections for your consideration. The general rule of thumb is to never store coins in their original vinyl holders to avoid damaging their surface. Cardboard coin holders are inexpensive and very easy to use – you can simply fit your coins inside cardboard envelopes and staple them securely. 1. 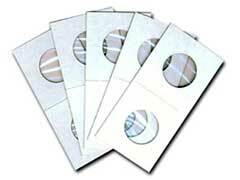 Cowens Standard 2×2 cardboard coin holders are considered one of the simplest and best choices for all collectors. Each cardboard holder has 2 round holes fitted with Mylar sheets to protect your numismatic collection from dust, moisture and air. These come in 3 sizes to hold all of your nickels, dimes, quarters and dollars. 2. SuperSafe Self Sealing cardboard coin holders are very convenient and there’s no need for a stapler. You can easily position your coins and seal them in one step. 3. Lighthouse Adhesive Style cardboard coin holders. Similarly to its competitor SuperSafe, Lighthouse brand offers superior sealing, however it is recommended you use these with lighter weight coins because heavier coins have a tendency to fall out after adhesive wears out. 4. Cowens Standard 2 x 2 with boxes is a great way to store your entire numismatic collection. It’s also much more cost effective to buy coin holders in bulk. Boxes fit easily in safes and storage boxes of all sizes. 5. Guardhouse 2×2 Standard is manufactured from lighter cardstock allowing you more room for coins with less storage room required. Some collectors also like this type better due to easier stapling. Cardboard coin holders are a great way to store your coins. Some numismatists prefer them over plastic varieties as Gold Eagle coin holder for superior protection and long term storage needs. Willing to learn more about South African gold coins? Our website offers a plethora of articles on this subject.